The word is most definitely out (as is the case with virtually all of the waves in Bali in this day and age) on the next tasty wave I visited as there are already quite a few lodging and dining options catering to surfers in Balian (particularly as compared to Medewi) and quite a few more new places in varying stages of completion. And for good reason. The wave is solid. 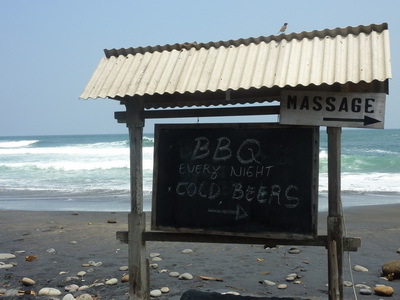 As is the black sand beach on which it breaks. It’s an a-frame with the left being the better half. But the rights are fairly righteous in their own right. Right? It’s located at a river mouth which is largely responsible for giving the wave it’s lovely shape. Unfortunately it’s also responsible for making it rather sharky as river mouths are to sharks as buffet lines are to humans. There were actually several sightings of a mako, or makos, cruising the line up while I was there. It’s reportedly a swell magnet meaning the contour of the seafloor in the area is such that it gathers wave energy and funnels it into the break. 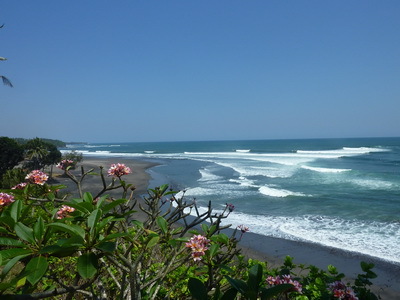 If there isn’t much surf elsewhere on the island, there will often nevertheless still be waves to be had in Balian. And if it’s big elsewhere around the island, then it’s probably going to be very big here. 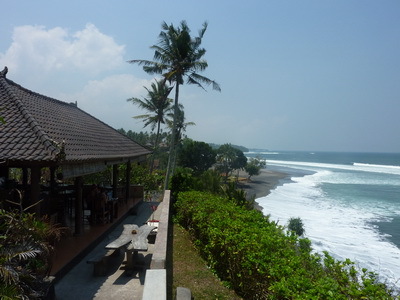 Balian was good to me. Solid 10 footers and plenty of waves to go around. Unlike some of the spots on Lembongan, this wave can hold a crowd. And while there were certainly some cleanup sets that rolled through and dished out the typical beatings you would expect in surf of that size, they were administered without the threat of being raked over sharp coral unlike at the majority of quality waves in Bali. I spent my days in Balian surfing, taking long exploratory strolls on the enormous (at least at low tide) black sand beach, surfing, reading on the veranda of my sweet ocean view hut at Ibu Ayu’s Homestay, surfing, watching fishermen do their thing, surfing and eating dinners at a cool cliff side warung run by Deki and a few of his Balinese surfer buds. 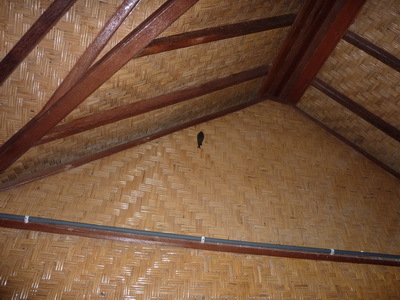 As for my evenings… well, I spent at least one of them sharing my room with a bat. I was partially awoken one night by the sound of something buzzing or flapping around in my room. Whatever it was didn’t make another sound after the initial commotion and since I was barely awake and not all that interested in investigating, I went with the assumption that it was a big bug and went back to sleep. I was getting ready for bed the following evening when I noticed something black hanging high up on one of the walls of my room. Upon closer inspection, that black something turned out to be a bat. But since he seemed fairly well behaved (i.e. fast asleep) and since I would be sleeping under mosquito netting, I figured I’d let him be and hope that he took his leave at some point in the night via one of the screenless open windows. I did, however, take the precaution of moving my backpack out from under Bat as I had no interest in there being a guano deposit on it come morning. Bat checked out at some point that evening without saying goodbye and I did the same the following morning… except with saying goodbye to Ibu Ayu. It was time for a short break from the beach. I was headed for the mountains. But not of Busch. Or Bintang for that matter.